Add the perfect adventure to your Royal Gorge vacation with any of our Colorado white water rafting trips. There’s a reason Echo Canyon River Expeditions is the largest commercial river rafting outfitter in Colorado. It’s because at Echo, we create the most exciting, safe and fun white water rafting adventures in the Rocky Mountains. We craft unique trips that offer something for everyone, and at any level of experience and comfort. Read more to learn about some of the river rafting trips that set Echo Canyon apart from the rest, or scroll down to see all of our Colorado rafting trips. Not only do our multi-day rafting trips offer some of the most beautiful scenery and exciting rapids in all of Colorado, they also provide some of the most relaxing camping. Hearty and delicious meals are freshly prepared by your guides by the river, as you and your group relax, play games, and reflect on your awesome day of rafting the Arkansas River! Take an adventure with Echo Canyon on the Dolores River and explore towering ponderosa pines, thick piñon and juniper forests. Take a hike up to an ancient Anasazi granary high on a cliff and enjoy the Rocky Mountain scenery. The San Miguel River is a jewel of river beginning above Telluride, Colorado, in the rugged San Juan mountain range. This wilderness oriented river offers class II and III whitewater on a 3 day river trip by Echo Canyon River Expeditions. Just about an hour away from Colorado Springs, near both Canon City and the spectacular Royal Gorge, Echo Canyon puts together the perfect adventure to fill out your Rocky Mountain vacation or trip. We offer full day or half day white water rafting trips, family floats, awesome package deals that include train rides, ZIP lines, ATVs and more. Choose to add these additional activities on the same day as your raft trip, or allow us to schedule a few days of your vacation itinerary to make planning as painless as possible. We also offer multi-day Arkansas River rafting adventures, camping, cabin and vacation home rentals, world class food at our own 8 Mile Bar & Grill and so much more! Echo Canyon can help you reserve Colorado rafting trips that leave from Buena Vista – still on the Arkansas River but closer to Summit County and Breckenridge – and we work with other outfitters throughout Colorado to offer the most white water fun you can find, at great prices. Our Colorado Springs rafting excursions on the Arkansas River are the most popular rafting in Colorado, including the Royal Gorge section (for the more experienced adrenaline junkies), the Bighorn Sheep Canyon section (for the less experienced, intermediate adventurers and families) and the popular Family Float Trip (for the beginning, inexperienced rafters or families with kids 3-5 years of age first getting their toes wet). In the Summit County or Buena Vista area, you’re close enough to try out the family-friendly Browns Canyon or go big with the high-adventure Numbers sections of the Arkansas River. Not sure which section of river is best for your group or closest to where you’re staying while visiting? Allow us to help – we want your experience to be like no other, so we will steer you in the right direction. Colorado is lucky to be home to a number of rivers to afford travelers choice and flexibility for vacation planning. 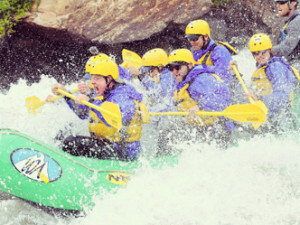 The Arkansas River isn’t your only option for rafting in Colorado. If you are staying in Denver your closest option is one of several Clear Creek trips; sure to satisfy your taste for adventure. Choose the family-friendly Gold Rush 1/3 day trip, or test your nerves on the Upper Clear Creek section which includes exciting class III and IV rapids. You can even combine the two trips into a full day trip including a delicious BBQ lunch served right at the river. Let our friendly phone staff know if you’d like to add a zipline tour to your itinerary while in the Idaho Springs area and round out the day!